This is the statement I struggle with the most because it doesn’t seem like a brave thing at all to me. In fact, it was impulsive. I didn’t wake up that morning with the intent to shave my head. Although my hair wasn’t as thick or curly or distinctively red as it once was, I loved it – in all its curlyish, reddish splendor. I was caught up in a massive, twisting swirl of emotion and decided, in those few seconds, that I was going to do it. It didn’t feel brave as I sat in the chair, having my hair put into tiny ponytails so it could be donated. It didn’t feel brave as I felt the buzzer make its first swoop across my perpetually-hot head. In fact, it was so incredibly calm that I didn’t really feel like anything. Left: day zero. Right: day seven. So I’m struggling with brave. I’ve gotten funny looks from people – on Saturday, a woman walked past me twice at Target, blatantly staring while I talked to a friend in the aisle. Others have assumed I’m sick and have asked me outright. A last at church said “So what happened to your hair?” very boldly. Others still think I’m making a statement about my sexuality. But I don’t think it takes bravery to deal with that. Just a thick skin and lots of patience. 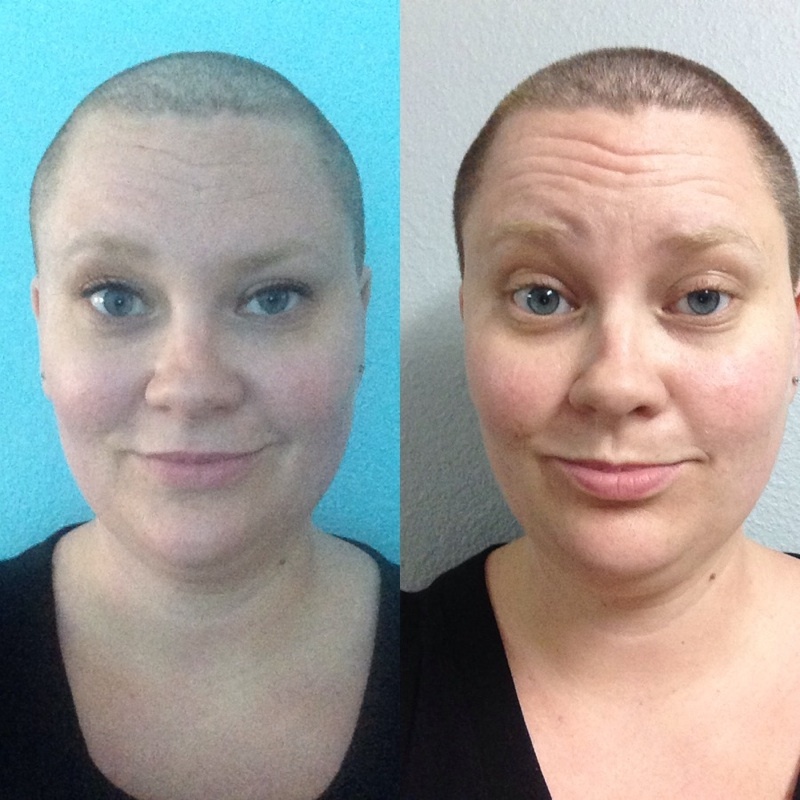 Because the thing is, I made a very willingly, albeit impulsive, decision to go bald to raise money for pediatric cancer research. Like it or love it, it was a choice I made. And my hair will grow back – is already going back quite nicely, thanks to some supplements I’m taking. I don’t mean to diminish the positive support of those who call me brave, but I’m 30 years old (for two and a half more weeks!). I’ve relatively healthy. I have a lot of life ahead of me, and a lot of hair ahead of me. What is brave, if I am not? Listening to God speak, and responding with obedience. I am terrible at this. For evidence, let me remind you of the six months God clearly told me through His word, pastors, and other Christians (all without knowing what I was wrestling with) that He was calling me to volunteer at the pregnancy center. I said, “No no no, this isn’t what You’re calling me to do. Something else. Anything else.” I practically had a nervous breakdown when I read a chapter in Weirsbe’s On Being A Servant of God about how God sent a big fish to a disobedient Jonah. I mean. For the love. Could it have been anymore clear? Eventually I said yes, but it cost me a lot – and the cost could have been avoided if I had said yes in the first place when I recognized God’s calling on my life to serve. It was only to be for a short season, but it was what He had for me. Because I know how hard the yes can be, I am always so inspired by those who shove past the no to grab hold tightly to the yes: past the uncertainty, the fears, the doubts. Past Satan’s whispers of “You’re not good enough” and “You will never succeed” and “Did God really tell you…?” a la Eve in the Garden. Sometimes the yes is scary. Sometimes it seems like it’s going to be a giant disaster, a horrible plan. But the yes is always worth it when it’s done the way God works it. I think of Joshua and Jericho. Can you even imagine how crazy it must have been to say yes to God when He said to walk around the walls of Jericho? To say yes to yelling to knock down the walls? But that’s what Joshua, under the authority of God, had the Israelites do. I can’t imagine God telling my pastor to tell us to walk around a firm, well built wall seven times on that seventh day, shouting at the right time, and watching the walls fall. Cannot fathom it. But that’s exactly what happened. God knew. He ordained it. And brave Joshua, and his brave people – they did it because they trusted in God. Trusting in God. I’m working really, really hard on making that a reality. Some days I do it better. Some days I feel like I can’t even turn to God because all I’ll do is present Him with a list of things I would like Him to do or give to me, and I know that my heart is in a very ugly place in those moments. I wish it weren’t. I pray so much that it won’t be there for long. Can I direct us a little away from my own selfish heart to the hearts of a group of ladies that aren’t selfish, but instead incredibly brave? A few years ago, I saw that some bloggers I admire started doing a devotional study together using the YouVersion app and were tagging their tweets and instragram pictures with #SheReadsTruth. Over these last two years, the number of women participating has grown by huge numbers – huge! They’ve written their own plans, many of which I have participated in (mostly quietly). They launched a beautiful website. God has given them this crazy dream of doing something more – and they’re say yes. They’re building an app. The #SheReadsTruth team has started a Kickstarter project. Their initial goal was to raise $35,000 by April 22 at 9:59 pm. Within 22 hours of opening the project, they had raised every single dollar they needed. Speechless. It literally left me speechless. Have you met me? I AM NEVER SPEECHLESS. So now they are actively working on their next goal: $65,000 – because that first goal only covers an iPhone app. I own an iPhone, but I want my sisters who have Android devices to share in the app fun with me, and that is exactly what this next goal will make happen. It’s going to be a killer app. It will have full versions of the Bible in it (they’ve already secured the rights to a few), the ability to take + edit pictures, reading plans/devotions (for purchase), the ability to journal, and so much more. I’ve backed this project because I full, utterly believe in what #SheReadsTruth does – it is bringing women of different ages, backgrounds, denominations, and seasons of life together to study God’s word. One of the reasons I love the fact that this app is happening is because I remember so strongly what it felt like as I got my life together in my late 20s and returned to seeking and following God. Long before I started coming to church again, I felt the hunger to be in God’s word and to be in fellowship with other women, but I was afraid to reach out to my circle of real-life friends. I would have loved a place like #SRT to read and journal and question with other women. God gave me exactly what I needed in the form of a friend who allowed me to do the same things, but can you imagine how an app like this could change the lives of women who are questioning? I could say, “Hey, download this app and let’s do the This is the Gospel or the This is the Bible study together.” Imagine. Just imagine how that would connect her with tens of thousands of other women who would love and support her, give her community and support. It makes me want to sob with the beauty of it. Will you consider backing it? $1 or $10,000 – every dollar raised counts. Every dollar is a woman who will get to experience God’s word with another woman, no matter how much physical or emotional or spiritual distance separates her from other women. Watch the video below and head over to the #SheReadsTruth Kickstarter page to back the project. Wow, Krista. So much good – love this! Thanks, Raechel! My hearts just wants to burst at the thought of all that you and the rest of the #SheReadsTruth team are doing – and I want to share that as much as I can!